The United States of America, in recent years, has seen a resurgence of interest in Cannabis for its' potential healing capabilities. Unfortunately, there is still a lot of misinformation and propaganda around this plant due to competing special interest groups. Even "research" that is carried out in a supposed attempt to reveal the facts end up being skewed, often producing biased results. In the summer of 2018, Canada became the second country to legalize Cannabis for recreational use, the first being Uruguay in South America. In 2017, Mexico legalized Cannabis for Medical use, so called Medical Marijuana. More and more states in the United States have legalized Medical Marijuana and other states are considering legalizing Cannabis for recreational use. This revealing book looks at Cannabis from three very different perspectives: Behavioral Health Pharmacological and Physical Health Personal Development and Spiritual Health Three individuals from varying backgrounds coming together to bring the reader information they can use to make an intelligent choice regarding the use of Cannabis. 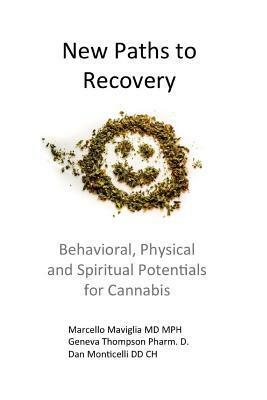 Dr. Marcello Maviglia is a board certified psychiatrist and specialist in the field of addictions. His focus in this work is on the ways in which research is being carried out on Cannabis. Dr. Geneva Thompson is a doctor of pharmacology. She drills down to the molecular level to help the reader understand the body mechanics of how Cannabis reacts with the human system. Dan Monticelli is a compliance executive, certified hypnotherapist and holds a doctor of divinity degree. His focus is on personal development; higher consciousness and effective grow methods for Cannabis. Life is full of tough choices. The information contained in these three sections will help those who want to know more about this amazing plant and how it can possibly be used to benefit them physically, mentally and spiritually.